Surprisingly little research work has been carried out on ‘landscapes of peace’. Dedicated specifically to the pursuance of peace, these places are distinct from spaces of memory or remembrance. Landscapes of martial memory - cemeteries, preserved battlefields, ornamental displays - have been treated generically as spaces, parks or gardens of remembrance, but have rarely been critiqued as zones that espouse values of peace. 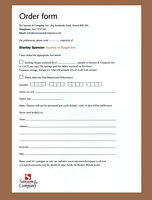 This Arts and Humanities Research Council project begins to explore this missing dimension. In military parlance, ‘dead ground' is terrain that is hidden from view due to undulations or obstacles. In this volume of essays about the abiding memory of the First World War, it refers to a benighted landscape crammed with danger, a haunted place which gripped the imagination. To many artists, poets, writers and musicians it was a phantasmagoric land, a place of wicked enchantment. In this book Paul Gough revisits the battle torn terrain of Belgium, France, Macedonia and Turkey to explore places of traumatic memory that are now peppered with memorials and plaques, connected by countless military cemeteries, those ‘Silent Cities' strung out along the edges of the old battle lines like the beads on a rosary. Through the eyes of photographers and painters, gardeners and designers, the eight illustrated essays examine the visual and material cultures of war and its lingering aftermath. 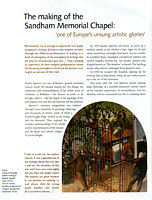 Published by Sansom and Company in collaboration with The National Trust and the Stanley Spencer Gallery. 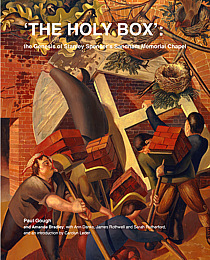 This new book draws extensively on rarely seen archive material to relate the origins of the Chapel. It tells the complicated and often intense relationship between the architect, the patron and the painter. The book offers a rich insight into one of the greatest war memorials in northern Europe and is told by leading academics and curators Amanda Bradley, Paul Gough, James Rothwell, Sarah Rutherford. The book has an introduction by Carolyn Leder. 212 pages, over 100 illustrations, 25 in full colour. In 1989, at the age of 22, Paul Lewin left Bristol, where he had studied Fine Art for three years and travelled three hours south to West Penwith in Cornwall. He intended to stay for a few months so that he might rekindle an interest in the Cornish landscape he had first experienced at art school. He never returned north and has been based in the far south-west ever since. Lewin hailed from Manchester, that vast conurbation and 'ideopolis' in the north-west of England, arguably the country's second city after London. As a young boy of seven or eight, he remembers being taken for a visit to nearby Stockport College of Art by his father, who was then studying textile design and helping to mix the coloured gouache paint for intricate wallpaper and carpet designs. A talented child at secondary school, the young Lewin showed such potential in drawing that he gained a place at the same college, which was then renowned (as it still is) for its attention to the essentials of fine art practice. Lewin prospered under vthe guidance of such lecturers as Duncan Watnough and Derek Wilkinson who laid taught drawing from rigorous observation and laid down the principles of the craft of painting. 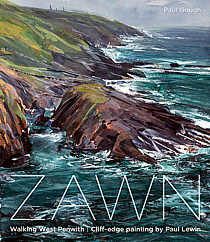 This new book takes the form of a collection of existing paintings, and others created specifically for this publication, each painting marking a walking line west from Newlyn along the headland to Land’s End, then north to Zennor. The images are accompanied by a text written by Paul Gough. contextualising Paul Lewin’s practice in the history of Cornish painting, the tradition of en plein work, but also offers a commentary on the artist’s sojourn across West Penwith. The book also includes an interview between the painter and writer which covers the artist’s approach to painting, his methods, materials and those artists and writers who matter most to him. In the year which marked the centenary of the start of the First World War, a series of creative projects in Bristol considered past, contemporary and continuing conflicts. A unique record of these exhibitions and events has now been captured for this book. 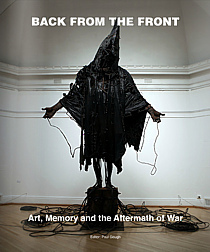 Under the generic title Back From the Front: Art, Memory and the Aftermath of War the projects consisted of five overlapping exhibitions staged at the Royal West of England Academy in Bristol, UK - a curated show of work by John and Paul Nash; a unique gathering of work by contemporary artists examining war and peace under the title Shock and Awe: Contemporary Artists at War and Peace, and a sequence of exhibitions united under the word Re-membering, which were a series of commissions funded by the Arts Council England and co-ordinated by the Bristol Cultural Development Partnership and Bristol 2014. A fifth exhibition The Death of Nature gave a showcase to the recent paintings of Michael Porter RWA. 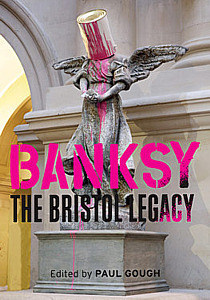 There have been many celebratory books about Banksy, but this is the first non-partisan documentation of the Bristol event and an attempt to assess its local and wider impact. More than a dozen commentators, including art curators, historians, economists, journalists and local government managers, attempt to answer a raft of questions: Is Banksy a subversive influence or merely a bit of fun? Why is Banksy so important to Bristol? Are we dealing with art, ‘street art’ or graffiti? Where does the exhibition leave Bristol as an epicentre of ‘street art’? What was its economic impact? The book looks at the setting up of the show and questions the need - other than to conform to the required Banksy mystique - for secrecy. Bristol City Council took an unprecedented risk in allowing the Banksy team a free run of its galleries. The implications of this for future museum practice and for State encouragement of the popular arts are dealt with in detail. In the wake of the exhibition the council designated a run-down area of the inner city for a ‘street art’ bonanza, inviting artists from around the world. The book attempts to judge the success of that initiative. Finally, a practising lawyer asks whether Banksy’s work can be given ‘listed building’ consent. Article: Banksy: Paul Gough : Painter, Polemicist, or Prankster? As war broke out across Europe in 1914 the Vorticist painter Wyndham Lewis advised: ‘You must not miss a war, if one is going! You cannot afford to miss that experience’. He may have been playfully ironic, but he recognised that the Great War presented a set of complex challenges, that might make or break reputations at a critical juncture in British art. Many artists, poets and writers have had to live with the uncomfortable recognition that conflict fuels their muse, invigorating the imagination and honing their creativity. Paul Gough examines the work of those who were made famous by the war, and those whose reputations were almost irretrievably damaged. 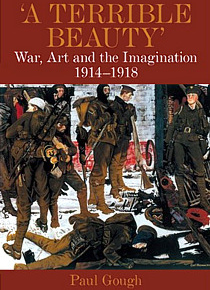 He explores in detail the wartime lives of fifteen artists - many of whom saw active service - who are central to the way we now visualize the War on the Western Front and on more distant battlefields in Macedonia and Gallipoli. When serving as an orderly at the Beaufort Military Hospital, Bristol, during the First World War, the young Stanley Spencer met Desmond Chute, a 20-year old aesthete and scion of a noted Bristol theatre family. A close friendship ensued, as the 31 letters in this collection attest. Far more sophisticated and better educated, Chute introduced the older man (Spencer was 24 when they met) to classical literature and great music and, perhaps most crucially, to the Confessions of St Augustine. Chute's influence on Spencer s intellectual development cannot be exaggerated. Spencer's often illustrated letters include some written while awaiting posting overseas, others from the battlefields of Macedonia give glimpses of his tribulations in a theatre of war, along with extraordinarily well-wrought reminiscences of Cookham, colourfully populated with places and characters. A few, concluding, letters were written from Fernlea back in his home village, and Hampstead in the 1920s. Desmond Chute (1895-1962) was for a while at the Slade School of Art. He became an assistant to Eric Gill, and involved in the Guild of St Joseph and St Dominic. He was admitted as a Catholic priest in 1927, moving to Italy where he was a friend of Ezra Pound. He had some success as a published writer and playwright, including a radio play broadcast by the BBC in 1955. 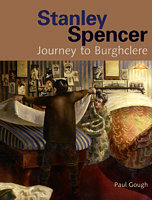 Paul Gough tells the story of Stanley Spencer's journey from cosseted family life in Cookham, through the menial drudgery of a war hospital and the malarial battlefields of a forgotten front, to his unique visions of peace and ressurection in Burghclere. Using his own letters, illustrations and paintings the book locates Spencer's work alongside other soldier-artists of the time and shows how his war experiences of 'innocence, fall and redemption' derived from his personal story as 'orderly, soldier and patient'. 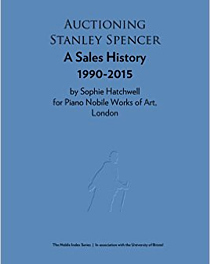 Gough, P.J., (2016) ‘The elsewhere of my mind…’: reflections on the art of Stanley Spencer, Introduction to Sophie Hatchwell, Paul Gough, Simon Shaw-Miller, Auctioning Stanley Spencer: Oil Painting Sales 1990-2015, Piano Nobile, London, 2016, ISBN10 1901192415. Gough, P.J., (2016) ‘Seeking the kingdom of heaven…’ Stanley Spencer (1891-1959) painter, writer, visionary, in Richard Heathcote and Anna Jug (eds. 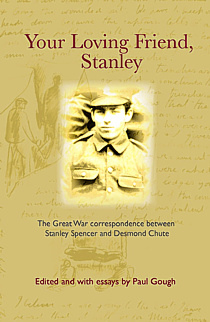 ), Stanley Spencer: A Twentieth-Century Master (Wakefield Press, Adelaide, Australia, 2016). Gough, P.J., (2016) 'Bansky: What’s the fuss and why does it matter?’, in Joseph Siracusa (ed.) Humanities, Arts, and Social Sciences: it’s everyone’s business, (Sydney and London, Routledge, 2016). Gough, P.J., (2001) Landscapes of War (and Peace) in Monuments and the Millennium, James and James / English Heritage, 228 - 236, 4 x b and w illus. 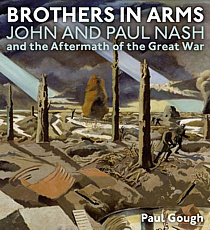 Gough, P.J., (1999) ‘A War of the Imagination: the experience of British artists in two world wars’ in Lightning Strikes Twice, Personal Experiences of Two World Wars. London, Leo Cooper.